Bleed Eagles Green: Philadelphia Eagles Blog: Too Early To Think 2009? Boldin to the Eagles? Too Early To Think 2009? Boldin to the Eagles? The Eagles have their first full team training practice this afternoon for the 2008 season. Does that mean it is too early to start thinking about 2009? Would the Eagles have any interest in possibly trading for Anquan Boldin next off-season? Reports have Boldin royally ticked off at the Cardinals for not following through on a promise and giving him a new contract. Boldin is currently under contract with the Cardinals through 2010. Boldin is so frustrated that he has told his agent Drew Rosenhaus to end negotiations and that he would not re-sign with the team. Such a statement would seem to put the Cardinals in a tough spot. Do they let Boldin play out his deal and possibly get nothing for him in return or do they trade him next year? 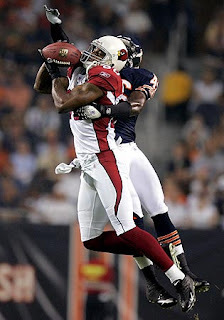 After paying fellow WR Larry Fitzgerlad big money the Cards would be hard pressed to also find money for Boldin. So, looking ahead to 2009, how about the Eagles making a run at Boldin. Maybe Sheppard has a big 2008 and can be included in the trade package?!? Looks like this off-season all over again!! So why don't they work quick to ink a deal for sheppard before the season starts, the cards could use a solid corner, and it would kill two bids with one stone for the Eagles.